Based in Long Island City New York, Elisa Carlucci is a designer and sculptor who creates furniture, lighting, and acessories. Her designs capabilities range from new traditional to modern. Based in Los Angeles, luxury home furnishings brand Quintus launched their third collection of Elisa’s designs in March 2018 at West Week. The 16 piece collection includes case goods and upholstery and is represented at ten to-the-trade showrooms throughout the country. Her work has been featured in various publications such as Elle Decor and Interior Design. Elisa’s career has included tenure in the design studios of Tiffany & Company, Calvin Klein Home, Pottery Barn, Target and Victoria Hagan Home. In 2012 Elisa opened her own design studio. Notable projects include lighting, furniture and surface designs for Waterworks, reimagining the Quintus brand and designing a collection to relaunch it in 2014. Between 2014 and 2016, Elisa collaborated with an interior design team to create over 75 pieces of bespoke furniture for a private home in Malibu, CA. In 2016 she designed lighting for the Beechwood Mansion Museum in Newport Rhode Island, and in 2017 she designed a private label collection of upholstery for Fabricut, one of the countries largest textile brands. Elisa received her Bachelor of Arts in Illustration from Parsons School of Design in New York in 1996 and is a strong believer that great visual communication is the key to all successful design projects. She lives with her family in NYC. The beauty of form is the central theme in my work. An appreciation for the beauty and purity of balance is inherent in my art. 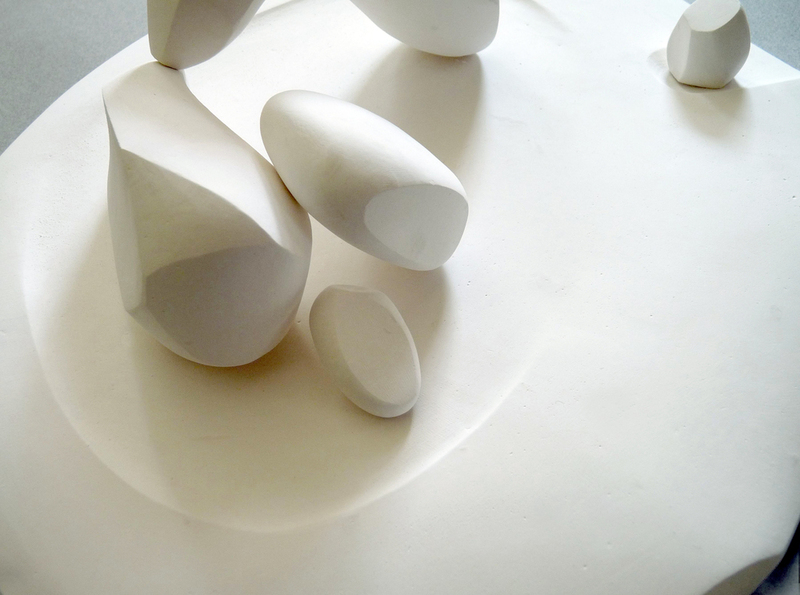 My sculptures of single forms explore how a shape exists in a space and how it interacts with the light and shadows in that space; other sculptures examine how multiple shapes interact with each other, converging on or coming from a single point to create their own miniature universe. All of my work examines the balance between organic and geometric elements. Although my art evokes elements of architecture, design and landscape, my sculptures are more archetypal in nature and represent an appreciation of natural shapes. There’s an organic quality to my work that’s evident in the curved, smooth textures of my sculptures, reminiscent of bone or stone. But I’m much more interested in light and shadow than in texture, and I tend to create objects in white or a single color because of their facility with manipulating light. I began sculpting in plaster both because of its matte quality, which works well with light and shadow, and also because of its soft, pliable nature which makes it easy to carve. My work has since evolved into sculpting with wire, bronze castings, as well as drawing as a way to explore new methods of creating volume and mass using reflective surfaces, line, and color.